Anyone intelligent knows the process is complicated. There are many influences on global climate including latitude and the layering of the atmosphere... These layers are not defined exclusively though they have different "qualities". These layers overlap and interact on fluctuating blurred edges... Thus someone might place the thickness of the "lower atmosphere" at 10 kms while others might place it at 11 kms... This makes nil difference to the understanding of the processes. The air pressure and the air temperature decrease with altitude and at about 5,000 metres we gasp for air... At 10,000 metres, the temperature is about minus 50 degrees Celsius. Between 10,000 and 12,000 metres, there is a thin layer of the atmosphere we call the Tropopause, where strong jet streams occur blowing eastward... Above 12,000 the temperature increases gradually until it reaches the Thermosphere where temperature increases rapidly. The average temperature of the Earth's SURFACE has changed over al periods of geological time, due to various factors — including cosmic Bolides (meteorites and comets) hitting the Earth AND CONTINENTAL DRIFT. Thus there has been periods of massive glaciation, of small glaciation and of no glaciation at all (with "warmish" polar temperatures). Presently, we are in a small glaciation event with variation-extent from the last Ice Age (surface temperature cooler than present by 4 to 6 degrees Celsius 12,000 years ago) to now. I consider the last ice age to have been a small ice age compared to some earlier in the Earth's 4 billion years history. We can say with confidence that the atmosphere is our insulating blanket... IT'S A VERY COMPLEX REACTIVE BLANKET. THE SUN and LIFE on Earth play important roles of influence on this blanket. Other influences include VOLCANOES, the earth axis wobbles ( Chandler wobble) and orbit wobble (Milankovitch cycles), gravity, and of course the GASEOUS COMPOSITION of the atmosphere itself. The atmosphere of Earth is retained by Earth's gravity. The atmosphere protects life on Earth by absorbing ultraviolet solar radiation, warming the surface through heat retention (insulation effect), and reducing temperature extremes between day and night (the diurnal temperature variation). Atmospheric stratification has distinct layers, each with specific characteristics such as temperature or composition. The atmosphere has a mass of about 5×1018 kg, 75 % of which is within about 11 km of the surface. The atmosphere becomes thinner and thinner with increasing altitude, with no definite boundary between the atmosphere and outer space. An altitude of 120 km is where atmospheric effects become noticeable during atmospheric reentry of spacecraft. The Kármán line, at 100 km also is often regarded as the boundary between atmosphere and outer space. The line was named after Theodore von Kármán, (1881–1963) a Hungarian-American engineer and physicist who was in the fields of aeronautics and astronautics. He first calculated that around this altitude the Earth's atmosphere becomes too thin for aeronautical purposes because any vehicle at this altitude would have to travel faster than orbital velocity to climb further up. There is an abrupt increase in atmospheric temperature and interaction with solar radiation at this jucture. Air is the name given to the atmosphere used in breathing and photosynthesis. Dry air contains roughly (by volume) 78.09% nitrogen, 20.95% oxygen, 0.93% argon, 0.039% carbon dioxide, and small amounts of other gases. Air also contains a variable amount of water vapor, on average around 1%. While air content and atmospheric pressure vary at different layers, air suitable for the survival of terrestrial plants and terrestrial animals is currently only known to be found in Earth's TROPOSPHERE and artificial atmospheres. Temperature increases with height in the thermosphere from the mesopause up to the thermopause, then is constant with height. Unlike in the stratosphere, where the inversion is caused by absorption of radiation by ozone, in the thermosphere the inversion is a result of the extremely low density of molecules. The temperature of this layer can rise to 1,500 °C, though the gas molecules are so far apart that temperature in the usual sense is not well defined. The air is so rarefied that an individual molecule (of oxygen, for example) travels an average of 1 kilometer between collisions with other molecules. The International Space Station orbits in this layer, between 320 and 380 km. The mesosphere extends from the stratopause to 80–85 km. It is the layer where most meteors burn up upon entering the atmosphere. Temperature decreases with height in the mesosphere. The mesopause, the temperature minimum that marks the top of the mesosphere, is the coldest place on Earth and has an average temperature around −85 °C. At the mesopause, temperatures may drop to −100 °C (Due to the cold temperature of the mesosphere, water vapor is frozen, forming ice clouds (or Noctilucent clouds). A type of lightning referred to as either sprites or ELVES, form many miles above thunderclouds in the troposphere. The stratosphere extends from the tropopause to about 51 km. Temperature increases with height due to increased absorption of ultraviolet radiation by the ozone layer, which restricts turbulence and mixing. While the temperature may be −60 °C at the tropopause, the top of the stratosphere is much warmer, and may be near freezing. The stratopause, which is the boundary between the stratosphere and mesosphere, typically is at 50 to 55 km. The pressure here is 1/1000 sea level. The troposphere begins at the surface and extends to between 9 km at the poles and 17 km at the equator, with some variation due to weather. 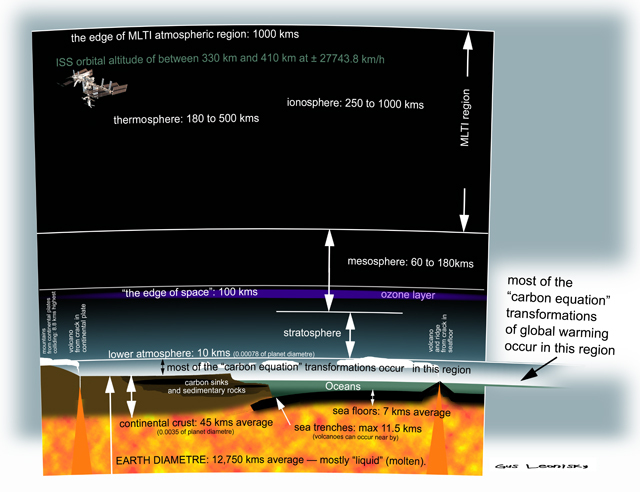 The troposphere is mostly heated by transfer of energy from the surface, so on average the lowest part of the troposphere is warmest and temperature decreases with altitude. This promotes vertical mixing. The troposphere contains roughly 80% of the mass of the atmosphere. The tropopause is the boundary between the troposphere and stratosphere. The ozone layer is contained within the stratosphere. In this layer ozone concentrations are about 2 to 8 parts per million, which is much higher than in the lower atmosphere but still very small compared to the main components of the atmosphere. It is mainly located in the lower portion of the stratosphere from about 15–35 km, though the thickness varies seasonally and geographically. About 90% of the ozone in our atmosphere is contained in the stratosphere. The ionosphere, the part of the atmosphere that is ionized by solar radiation, stretches from 50 to 1,000 km and typically overlaps both the exosphere and the thermosphere. It forms the inner edge of the magnetosphere. It has practical importance because it influences, for example, radio propagation on the Earth. It is responsible for auroras. The homosphere and heterosphere are defined by whether the atmospheric gases are well mixed. In the homosphere the chemical composition of the atmosphere does not depend on molecular weight because the gases are mixed by turbulence. The homosphere includes the troposphere, stratosphere, and mesosphere. Above the turbopause at about 100 km, the composition varies with altitude. This is because the distance that particles can move without colliding with one another is large compared with the size of motions that cause mixing. This allows the gases to stratify by molecular weight, with the heavier ones such as oxygen and nitrogen present only near the bottom of the heterosphere. The upper part of the heterosphere is composed almost completely of hydrogen, the lightest element. The average temperature of the atmosphere at the surface of Earth is 14 °C or 15 °C depending on the reference. Total atmospheric mass is 5.1480×1018 kg, about 2.5% less than would be inferred from the average sea level pressure and the Earth's area of 51007.2 megahectares, this portion being displaced by the Earth's mountainous terrain. Atmospheric pressure is the total weight of the air above unit area at the point where the pressure is measured. Thus air pressure varies with location and weather. 50% is below 5.6 km. 90% is below 16 km. 99.99997% is below 100 km, the Kármán line. By international convention, this marks the beginning of space where human travelers are considered astronauts. The summit of Mt. Everest is at 8,848 m; commercial airliners typically cruise between 10 km and 13 km where the thinner air improves fuel economy; weather balloons reach 30.4 km and above; and the highest X-15 flight in 1963 reached 108.0 km. Even above the Kármán line, significant atmospheric effects such as auroras still occur. Meteors begin to glow in this region though the larger ones may not burn up until they penetrate more deeply. The various layers of the earth's ionosphere, important to HF radio propagation, begin below 100 km and extend beyond 500 km. The average mass of the atmosphere is about 5 quadrillion (5×1015) tonnes or 1/1,200,000 the mass of Earth. Objects tend to emit amounts and wavelengths of radiation depending on their "black body" emission curves, therefore hotter objects tend to emit more radiation, with shorter wavelengths. Colder objects emit less radiation, with longer wavelengths. For example, the Sun is approximately 6,000 K (5,730 °C), its radiation peaks near 500 nm, and is visible to the human eye. The Earth is approximately 290 K (17 °C), so its radiation peaks near 10,000 nm, and is much too long to be visible to humans. 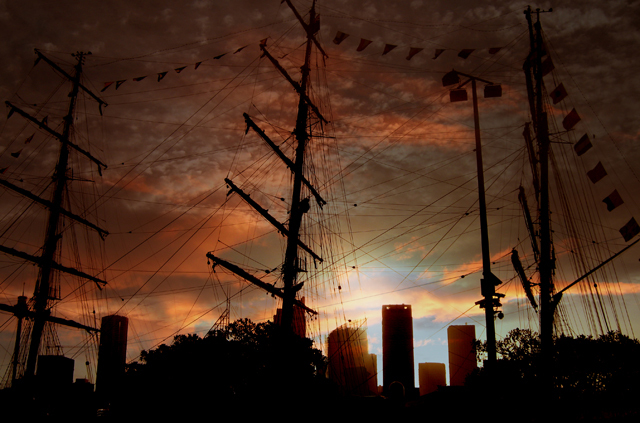 The atmosphere emits infrared radiation. For example, on clear nights the Earth's surface cools down faster than on cloudy nights. This is because clouds (H2O) are strong absorbers and emitters of infrared radiation. This is also why it becomes colder at night at higher elevations. The atmosphere acts as a "blanket" to limit the amount of radiation the Earth loses into space. The greenhouse effect is directly related to this absorption and emission (or "blanket") effect. Some chemicals in the atmosphere absorb and emit infrared radiation, but do not interact with sunlight in the visible spectrum. Common examples of these chemicals are CO2 and H2O. If there are too much of these greenhouse gases, sunlight heats the Earth's surface, but the gases block the infrared radiation from exiting back to space. This imbalance causes the Earth to warm, and thus climate change. Global dimming is thought to have been caused by an increase in particulates such as sulfate aerosols in the atmosphere due to human action. The term sulfate aerosols is used for a suspension of fine solid particles of a sulfate or tiny droplets of a solution of a sulfate or of sulfuric acid (which is not technically a sulfate). They are produced by chemical reactions in the atmosphere from gaseous precursors (with the exception of sea salt sulfate and gypsum dust particles). The two main sulfuric acid precursors are sulfur dioxide (SO2) from anthropogenic sources and volcanoes, and dimethyl sulfide (DMS) from biogenic sources, especially marine plankton. These aerosols can cause a cooling effect on earth. This article mostly adapted from http://en.wikipedia.org/wiki/Atmosphere_of_Earth and other sources. Water-related sediments have been found dating as early as 3.8 billion years ago. About 3.4 billion years ago, nitrogen was the major part of the then stable "second atmosphere". 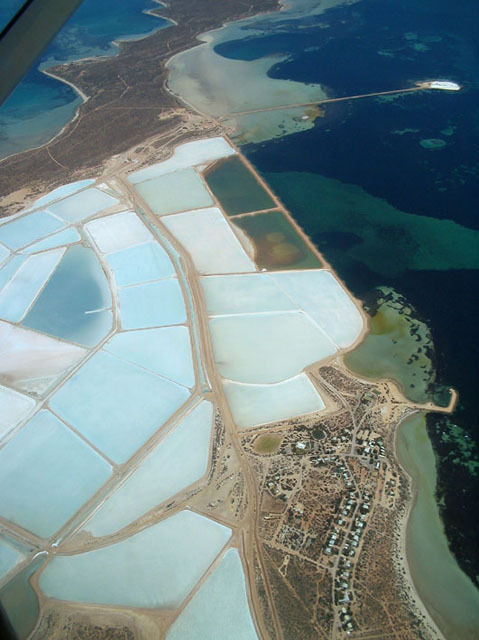 Stromatolites still exist today in places such as Shark Bay in Western Australia. The high level of salt concentration in the area protects these most ancient surviving-life forms from grazing by other more recent animals. The geological record however shows a continually relatively warm surface during the complete early temperature record of the Earth, with the exception of one glacial phase about 2.4 billion years ago. This important oxygen-generating process has been developing, though this oxygen was soon reabsorbed by "free" iron, in oxidisation. This end signifies a shift from a "reducing" atmosphere to an "oxidising" atmosphere. Oxygen molecules concentration went up and down until reaching a steady state of more than 15% in the atmosphere. We call the following time span, the Phanerozoic eon, during which oxygen-breathing metazoan life forms began to appear. The amount of oxygen in the atmosphere has also gone up and down during the last 600 million years. There was a peak 280 million years ago, when the amount of oxygen was about 30 %. This coincides with the era of the mega-insects such as the meganeura — large insects like dragonflies with wingspan of up to 60 centimetres.... The relationship between insects and oxygen is critical. Insects breathe through their carapace/skin and cannot grow beyond a certain size in accordance with the ratio of oxygen in the air. Please not that most of these transformation happened in the lower part (10,000 metres thick from the surface) which contains about 75 % of the molecules of the atmospheric gases. Plants converts carbon dioxide into the bodies of the plant, which release oxygen into the atmosphere via photosynthesis. Currently, anthropogenic greenhouse gases (CO2, methane and a few others) are increasing in the atmosphere. Increases such as this are paralleled with previous period of recorded global warming. Since the industrial revolution, in 1850, humans have added about 245 ppm of carbon dioxide to the 150 measured back then — the level of CO2 being 395 ppm presently. Scientists, aware of all the atmospheric gas composition and of previous instances of global warming (including that at the end of the last ice age 12,000 years ago) — rather than being plain meteorologists who concentrate on air-mass movements — are VERY ALARMED at this large increase. This important proportional increase CANNOT reabsorbed by plants nor by the oceans (now approaching CO2 saturation and turning "acidic") thus the increase in the level of CO2 parallels irrevocably past increases in temperature of the lower atmosphere. How have humans changed the CO2 proportion in the atmosphere? Humans are burning "fossil fuels" (from carbon sinks/storage) that have buried for aeons under bedrock in the form of coal, oil and gas... Humans have thus added more than twice the amount in extra carbon into this long-standing equilibrium of plant/sea/animals/atmospheric CO2. Air pollution is the introduction of chemicals, particulate matter, or biological materials — that cause harm or discomfort to organisms —into the atmosphere. Stratospheric ozone depletion is believed to be caused by air pollution (chiefly from chlorofluorocarbons). 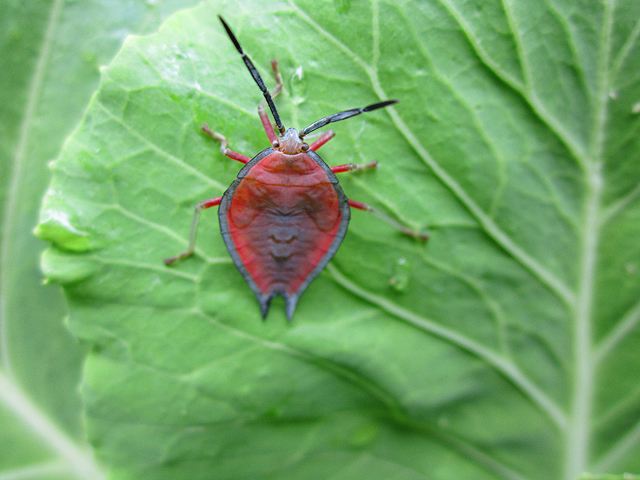 picture by Gus leonisky — bug on a cabbage leaf. CO2 is a very stable molecule and difficult to pull apart without spending more energy than CO2 itself can radiate. Photosynthesis is a complex process that using light (photons) and bio-chemistry to take away the carbon atom to build plant cells, including cellulose. Photosynthesis is a process used by plants and other organisms to capture the sun's energy to split off water's hydrogen from oxygen. Hydrogen is combined with carbon dioxide (absorbed from air or water) to form glucose and release oxygen. All living cells in turn use fuels derived from glucose and oxidize the hydrogen and carbon to release the energy and reform water and carbon dioxide in the process (cellular respiration ‚ see also ATP). Photosynthesis occurs in plants, algae, and many species of bacteria, but not in archaea (animal kingdom). Photosynthetic organisms are called photoautotrophs, since they can "create their own food". In plants, algae, and cyanobacteria, photosynthesis uses carbon dioxide and water, releasing oxygen as a waste product. Photosynthesis is vital for all aerobic life on Earth. In addition to maintaining normal levels of oxygen in the atmosphere, photosynthesis is the source of energy for nearly all life on earth, either directly, through primary production, or indirectly, as the ultimate source of the energy in their food, the exceptions being chemoautotrophs that live in rocks or around deep sea hydrothermal vents. The rate of energy capture by photosynthesis is immense, approximately 100 terawatts, which is about six times larger than the power consumption of human civilization. As well as energy, photosynthesis is also the source of the carbon in all the organic compounds within organisms' bodies. In all, photosynthetic organisms convert around 100–115 petagrams of carbon into biomass per year. Although photosynthesis can happen in different ways in different species, some features are always the same. The process always begins when energy from light is absorbed by proteins called photosynthetic reaction centers that contain chlorophylls. In plants, these proteins are held inside organelles called chloroplasts, while in bacteria they are embedded in the plasma membrane. Some of the light energy gathered by chlorophylls is stored in the form of adenosine triphosphate (ATP). The rest of the energy is used to remove electrons from a substance such as water. These electrons are then used in the reactions that turn carbon dioxide into organic compounds. In plants, algae and cyanobacteria, this is done by a sequence of reactions called the Calvin cycle, but different sets of reactions are found in some bacteria, such as the reverse Krebs cycle in Chlorobium. Many photosynthetic organisms have adaptations that concentrate or store carbon dioxide. This helps reduce a wasteful process called photorespiration that can consume part of the sugar produced during photosynthesis. Without photosynthesis the "Earthian" food chain would be non-existent. Without photosynthesis, there would be little bacteria (no mitochindrion in animals), no plants, no herbivores, no insects, no omnivores. Up to 150 years ago the photosynthetisation of CO2, the absorption of CO2 by the oceans and the CO2 content of the atmosphere was in a "carbon equation balance" at between 100 to 200 ppms CO2 of the gaseous composition of the atmosphere. The net gain is an increase of CO2 in the atmosphere from human activity. 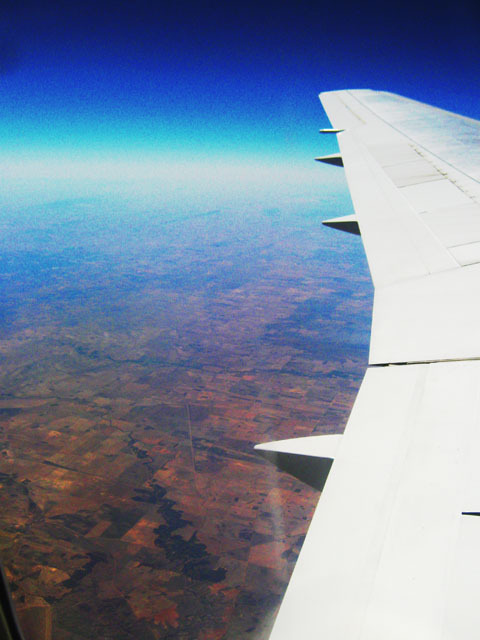 Picture by a friend of Gus — flying at the tropopause level. Below one can see cultivated fields, above one can see the stratosphere and the "beyond" we call space. Life: plants absorption of CO2 and release of O2 — animals absorption of O2 and release of CO2 — Blue green algae release of oxygen (and toxins)... Permafrost and decay of life release of methane. C) other oscillations that have local impact on weather patterns. Comets and meteorites impacts can lead to lower or higher temperatures on the Earth depending on many factors. Volcanos can release both sulphur dioxide and carbon dioxide but their plume of ash, steam and general cloud size can induce noticeable dimming that leads to some cooling. This figure does not include the compounding effect of increase temperature, nor the possibility of warming feed back mechanisms — such as massive increase of methane by modest warming. This "small" increase of 0.03 per annum is not noticeable to mere mortals. Only precise instrument measurements can define this warming trend on such a global scale. Instrumentation calibration is critical. Such small increase of temperature represents an enormous EXTRA amount of "energy" being loaded into and being dissipated by the Atmosphere... This trend has had an impact on weather patterns and weather extremes though one is still cautious in apportioning the blame of such "noticeable" present changes. Record hot Siberian temperature above 39 degree Celsius last year. Melting of the permafrost. The melting of glaciers, which in itself absorbs a lot of heat energy and retards the global warming trend.... Some glaciers are "growing" in specific areas— such areas are cold and "getting wetter" that previously recorded — such as the centre of Antarctica (warming up nonetheless) and some part of the Himalayas. Higher average sea surface temperatures. in average position — no effect to take note of. In the last couple of years, La Nina (lasting a bit longer than usual) has NOT made a dent in the warming of the surface of the planet. Other climatic oscillation have made impacts on local conditions but the average is still trending to warming. Evidence from mountain glaciers does suggest increased glaciation in a number of widely spread regions outside Europe prior to the 20th century, including Alaska, New Zealand and Patagonia. However, the timing of maximum glacial advances in these regions differs considerably, suggesting that they may represent largely independent regional climate changes, not a globally-synchronous increased glaciation. Thus current evidence does not support globally synchronous periods of anomalous cold or warmth over this time frame, and the conventional terms of "Little Ice Age" and "Medieval Warm Period" appear to have limited utility in describing trends in hemispheric or global mean temperature changes in past centuries... Hemispherically, the "Little Ice Age" can only be considered as a modest cooling of the Northern Hemisphere during this period of less than 1°C relative to late 20th century levels. Several causes have been proposed: cyclical lows in solar radiation, heightened volcanic activity, changes in the ocean circulation, an inherent variability in global climate, or decreases in the human population (plague and such). Lower CO2 atmospheric concentrations as noticed in Antarctic ice cores for this period may have also resulted from (or created) the colder global climate. It has been noted that the sun has been "dormant" for the past 11 years. Yet six of the ten warmest years since 1850 have happened in the last decade. It has been noticed too that the Thermosphere has been cooling down to 1100 from 1400 degree Celsius in the past decade — YET the lower atmosphere has still been warming up. Presently the sun is "waking up" and likely to increase the general temperature of the planet slightly. Presently CO2 has more than doubled its level in the atmosphere since 1850 AND RISING. Most of this can be attributed to anthropomorphic activities. The amount of CO2 released by human activities can be easily calculated by knowing how much fossil fuel we consume and transform into CO2... From steel making to transport we burn the carbon in coal and oil and produce about 5 to 6 ppms of carbon dioxide (CO2) added into the atmosphere. Some of this (up to 30 per cent being reabsorbed by the oceans) is processed by the "natural carbon cycle" but about 3 ppms per year REMAINS as EXTRA CO2 in the atmosphere. Since 1850, the anthropomorphic amount of CO2 added is now approaching more than 240 ppms. 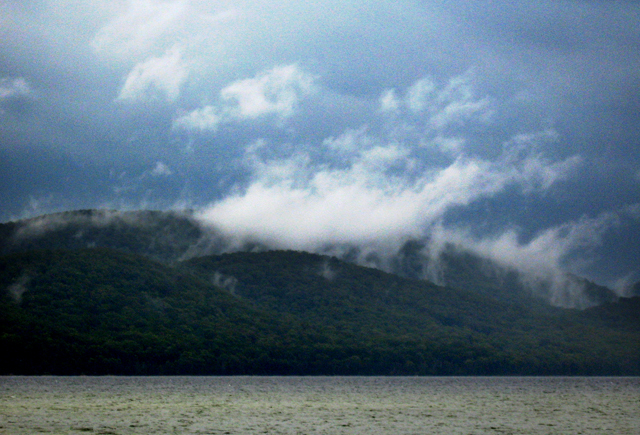 The more clouds (opaque, white water vapour), the less heat from the sun can penetrate down to the surface. But, in reverse, the less heat can escape from the surface back into space. Meanwhile, the more heat, the more likely to have clear water vapour depending on the dew point. Thus the dynamics of this complex process can interferred with a straight expected warming by giving strong periods of warming and some periods of cooling,. Nonetheless, the trend over several years is going towards warming. Colour: A black surface will warm faster than a white surface, This is a somewhat important part of the equation which leads say to the arctic region to become warmer because it can absorb more heat from the sun instead of reflecting it, as the ice melts. 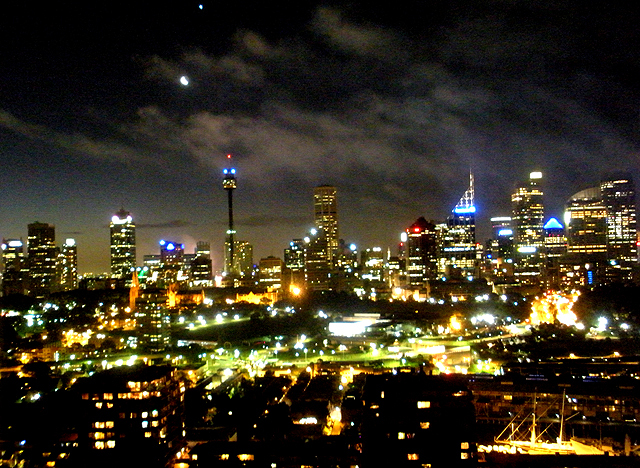 Low unshapen cloud over the city of Sydney... Picture by Gus. We now know that humans are producing more CO2 than the "natural carbon cycle" can "digest". We know that temperatures and CO2 are linked in some way. We know that CO2 is a "greenhouse" gas. Aerosols that used to destroy the ozone layer have been banned. We know that at the Tropopause tropical temperatures (in the minus 55s) have climbed 0,6 degree Celsius per decade since the 1970. We know that the sea level has risen at least 15 centimetres since 1850. Are we human enough to take the leap and link CO2 as the main culprit to this "change"? The Arrhenius equation is a simple, but remarkably accurate, formula for the temperature dependence of the reaction rate constant, and therefore, rate of a chemical reaction. [ The equation was first proposed by the Dutch chemist J. H. van 't Hoff in 1884; five years later in 1889, the Swedish chemist Svante Arrhenius provided a physical justification and interpretation for it. Currently, it is best seen as an empirical relationship. It can be used to model the temperature-variance of diffusion coefficients, population of crystal vacancies, creep rates, and many other thermally-induced processes/reactions. A historically useful generalization supported by the Arrhenius equation is that, for many common chemical reactions at room temperature, the reaction rate doubles for every 10 degree Celsius increase in temperature. One has to realise that until the mid 1940s, many scientist working on long range climate progression were of the conviction that the Earth was about to enter a new ice age, or a mini-ice age at least. It was not a secret, I remember my father talking about it. Though it is difficult to predict with high degree of precision, one can expect an increase of clear water vapours and cloudy water vapours leading to greater differential stress in the immediate atmosphere thus more damaging storms. We can expect a sea level rise of 45 centimetres minimum. We can expect "snap" hot droughts and violent floods. We can expect a greater change of climatic zone banding (as has been noticed already). Extension of tropical bands, squeezing the Temperate zones into the "warmer" and more climatically stressed polar zones. Present ocean currents may shift the position of their "turning points" where water sinks to the bottom or where water rise to the surface. Some computer models predict the slowing of the gulf stream, leading to a colder Western Europe, with stronger weather eddies (cyclonic winds and conditions) on the edge of temperate and sub tropical-tropical bandings. Some of the denialists are suggesting that Coral Reefs would grow better as presently recorded south of Japan as the seas are getting warmer... But Coral Reefs in already warm water, such as the Great Barrier Reef, could be stressed beyond survival north of a line above Bundaberg. The CO2 dissolved in the sea also makes the water acidic and has an impact on the development of many species... Other factor such as pollutants and fertiliser also have an impact. Temperature of 49 degree Celsius could be recorded in Victoria, creating "vicious firestorms when associated with strong winds"... Stronger monsoon in the north of Australia and more violent cyclones landing near Cairns... More violent flash foods in Europe, more wild-fires everywhere. All this will become noticeable by "1998". By 2015, things will take a leap for the worse and by 2032 (2030-2035) it ain't going to look pretty. That is to say, we need to cut our CO2 emissions by 50 per cent based on 1998 levels, by 2050 (not even forty years from now) and by 75 per cent by 2070. With a human population becoming more and more hungry for energy, food and water (It has been calculated that in the next 40 years, humans will consume more food than has been consumed in the past 8000 years), we are facing a Herculean task. From here on Earth, the Sun looks remarkably consistent, continuously bathing our planet in light and heat without much change from year to year, let alone day to day. 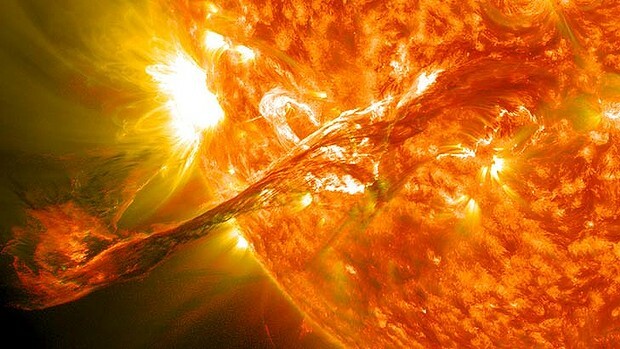 In reality, it's anything but calm, as this incredible NASA photo of a coronal mass ejection (CME) shows. On September 1, 1859, British astronomer Richard Carrington saw something extraordinary: amidst the usual shifting sunspots his telescope projected onto a sheet of paper, several blobs of blindingly white light grew and faded over the space of five minutes. His sketch is the earliest record of a solar flare, a rare"white light" solar flare. The Sun has gone blank, scientists say. For the second time in less than a month, not a single dark sunspot can be seen on the surface of our star. It's a sign that the Sun is entering a new stage in its solar cycle, a phase of decreased activity. This particular period of sunspotlessness will last for a few days. But eventually the periods will span for weeks and then perhaps months as the Sun goes into "solar minimum". Our Sun is a volatile star, and its surface is marked with sunspots. Sunspots, the dark areas on the Sun's surface which can be seen without a telescope, are areas of intense magnetic activity, which reduce the temperature of the star in their vicinity. They can prompt solar flares, radiation storms and geomagnetic storms here on Earth, causing phenomena such as the aurora australis (southern lights) and aurora borealis (northern lights). The Sun's surface changes through 11-year solar cycles. The greatest number of sunspots in any given solar cycle is the "solar maximum." The lowest number is "solar minimum". According to NASA, "during Solar Max, huge sunspots and intense solar flares are a daily occurrence. Auroras appear in Florida. Radiation storms knock out satellites. Radio blackouts frustrate CB radio as well. The last such episode took place in the years around 2000-2001. "During solar minimum, the opposite occurs. Solar flares are almost non-existent while whole weeks go by without a single, tiny sunspot to break the monotony of the blank sun. This is what we are experiencing now." So now, as our star enters a solar minimum period, the sunspots will slowly disappear. But that doesn't mean it's all going to go quiet in space. History shows there can still be big events during weak solar cycles. And, if the activity is strong enough, it could threaten our technology, wiping out electricity, the internet and jamming satellite signals across entire continents. In 1859, during a low point in the solar cycle, the "Carrington Event" prompted geomagnetic storms as far south as the Caribbean. Another event of that magnitude could hugely disrupt our lives today. The last few cycles have been getting progressively weaker, with fewer sunspots being produced in each successive cycle. It's too early to know if the 2020 cycle will continue this trend. The Sun isn't due to hit its solar maximum again until midway through the 2020s. But space weather forecasters - the people whose job it is to try and predict and protect us from the impacts of solar events - are already looking to that next cycle.